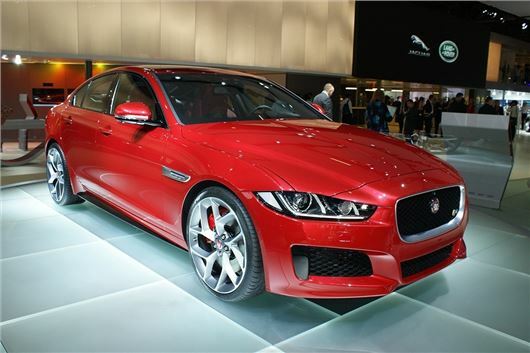 Jaguar has launched the new XE at the Paris Motor Show. The new Jaguar XE is powered by a range of four and six-cylinder all-aluminium petrol and diesel engines, with the latter offering up to 75mpg and 99g/km CO2. Prices still start at £27,000 and deliveries will start in May 2015. The new Jaguar XE rivals the BMW 3 Series and Audi A4 and is the British firm's first ‘affordable’ model to make it to market since its renaissance under Indian parent TATA. The four-door rear-wheel drive XE features a mostly aluminium body to save weight and increase chassis rigidity, along with a subframe-mounted independent rear suspension. The new XE is the most aerodynamically efficient road car to emerge from Jaguar, with a drag coefficient of 0.26. Visually, the XE carries styling cues from the XF and F-Type, with the latter influencing the rear portions of the car. Five engines will be offered with the headliner being the four-cylinder 2.0-litre diesel with 163PS and 380Nm of torque. Jaguar claims the XE’s Ingenium diesel engine can cover 21,000 miles or two years between services and return 75mpg. Emissions are low, with 99g/km of CO2, and the four-cylinder diesel is linked to an all-new six-speed manual gearbox. Expect more powerful engine variants in coming months, as Jaguar seeks to take on rivals from German makers. The petrol range is topped by a potent 3.0-litre V6, which generates 340PS and 450Nm of torque. The engine is the same supercharged unit found in the F-Type and gives acceleration from 0-62mph in 4.9 seconds. Top speed is limited to 155mph. The V6 will be offered in XE S models only. The cabin of the new saloon is kitted out with the latest in-car technology, which includes a colour laser head-up display to project speed and other car related data on the windscreen. The interior also gets an eight-inch touch screen, with smartphone connectivity, voice control and sat nav. Jaguar has also created a downloadable phone app to remotely programme the car, with options to pre-heat or cool the cabin and even find the car in a crowded car park. However, Jaguar hasn't confirmed or denied if the app will be free of charge. Prices start at £27,000 for the XE. Expect order books to open before the end of 2014, with deliveries starting in May 2015.